Do you remember what your favorite childhood drink was? 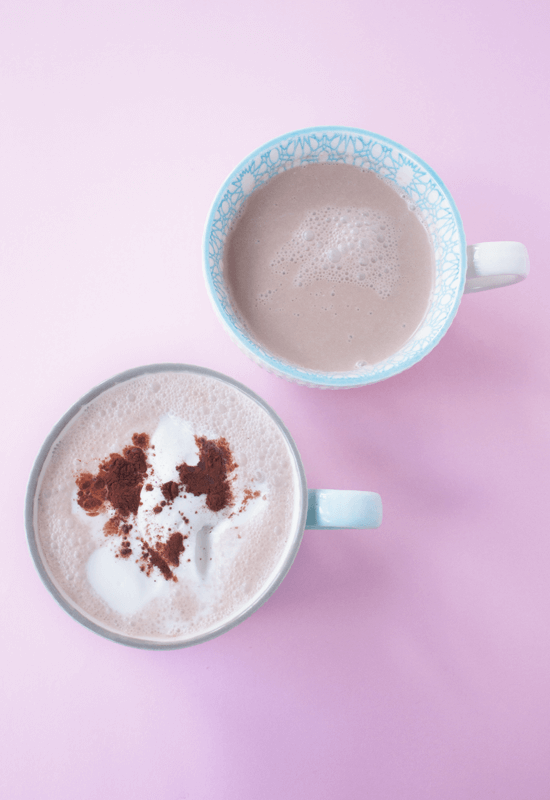 Mine was chocolate milk – as a little kid I adored this creamy, sweet drink. Back then it was still believed that dairy is good for you and I remember drinking it quite regularly. I still love chocolate milk, but nowadays I drink it with a plant-based milk such as almond or coconut. 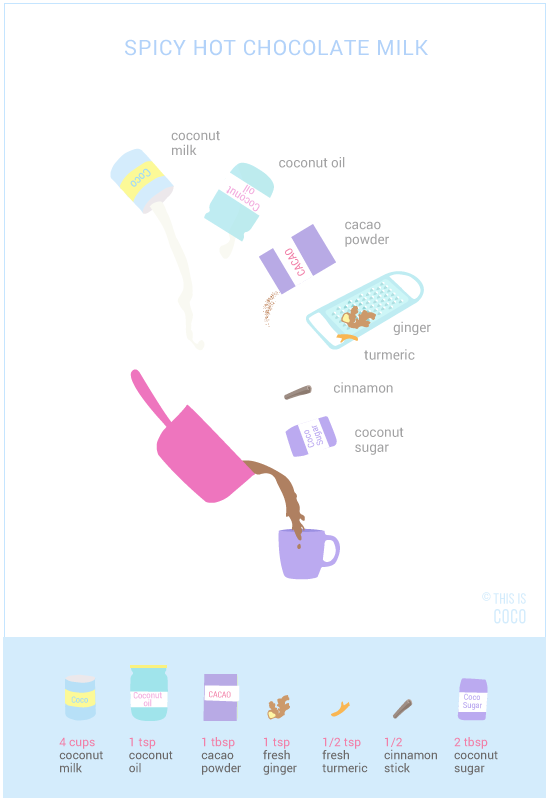 Sometimes I like to spice it up like in this recipe where I use fresh ginger, turmeric and cinnamon to create a deliciously sweet and spicy hot chocolate coconut milk. Ginger, turmeric and cinnamon are warming spices, praised for their beneficial health properties and used in Ayurveda. You can find them in other holistic hot drinks such as golden milk and masala chai. Using them as fresh roots is the tastiest and healthiest, but you can also use them in powdered form. This spiced beverage makes a lovely, warming drink that’s especially enjoyable during the cold season! If you want whipped coconut cream on your drink, you’ll need an extra can of coconut milk and prepare it a few hours on forehand. To make the creamiest whipped cream: put a closed can of coconut milk in the refrigerator overnight, which separates the creamy part from the liquid. The liquid is not needed for this recipe and can be used for a smoothie. Grate the ginger and turmeric and set them aside. 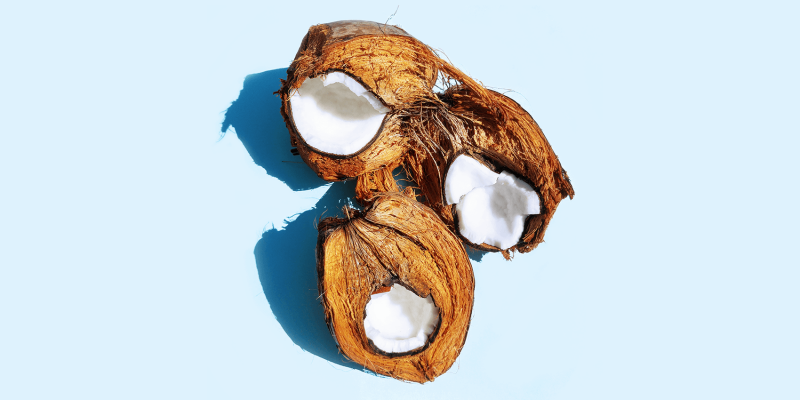 Use a saucepan and warm the coconut milk with the coconut oil on a low fire. Add the cacao powder while gently whisking until all the powder is dissolved. Add the grated ginger, turmeric, cinnamon stick and coconut sugar. Let it cook for 10 minutes on a low fire, while stirring regularly. Use a sieve to get rid of any ginger and turmeric pieces. Remove the can from the fridge and scoop off the top part. Place in a chilled mixing bowl. Mix the cream with an electric mixer for about a minute or until reaching the desired consistency. 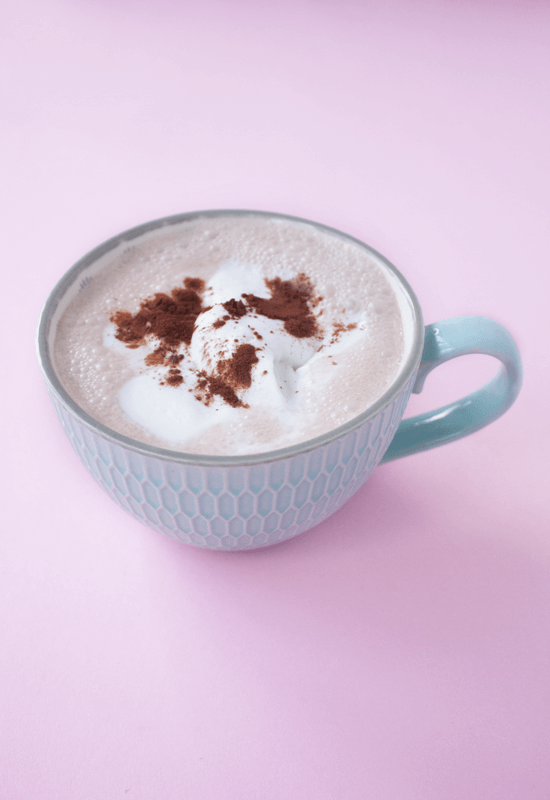 Pour the spicy hot chocolate coconut milk and top with the whipped coconut cream.